As I'm working on getting healthier, I am learning that losing weight isn't just about changing the way you eat and the amount of time you spend exercising. 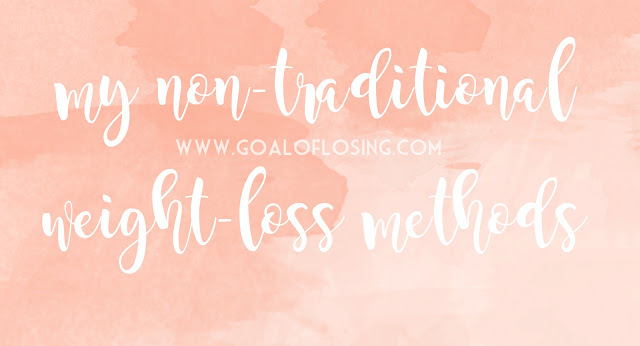 I have found that I have more success in losing weight when I focus on some non-traditional things, outside of just eating well and exercising more. For me, keeping a balanced bank account and a clean house both help contribute to my weight-loss success, too. Challenge: think of a stressor in your life and ask yourself how it can be hindering your weight-loss success. You may be wondering how banking and losing weight have anything in common at all. The answer is quite simple for me. When I know how much money I have to spend on groceries each week, it's easier to prioritize my meal plan and grocery list. I can feel better about splurging a little extra money on more fruits and vegetables or, when it comes to getting all of the ingredients to try a new recipe. I am trying to think of spending more money on fruits and vegetables as an investment in myself; an investment that I will have prioritized money for, since I'm on top of my banking. So in essence, keeping a balance bank account = more healthy choices = more weight loss. You can take that to the bank. See what I did there? Keeping my house in order can do wonders for losing weight, too. Especially when it comes to keeping the kitchen and my refrigerator cleaned out. When everything is in disarray around me, it can be stressful and stress is a trigger for binge eating. Having a clean, organized refrigerator has helped me to make so many better choices these past few weeks. When my refrigerator is full of too much stuff, it can be hard to pick out the good food; especially when I'm in a hurry. Now, I have fruit and vegetables chopped, prepped and placed well in sight to give me more incentive to eat more of the "good stuff" when it comes time to snack time. Keeping my house cleaned goes beyond the kitchen and the obvious living areas. It's important to keep up on my laundry, too. I can't tell you how many times I was able to find the motivation to work out and was knocked down a peg when I came to find that I did not have any sports bra's washed or my favorite capri's were no where to be found. I don't need any more excuses to not work out, trust me. Cleaned and put-away clothes = more opportunities to work out. Maintaining a clean atmosphere to help you lose weight is a real thing. I believe that outer chaos breads inner chaos, whereas outer calm promotes inner calm. I have noticed that even when I have a good reason to be stressed, I can't help but feel more relaxed when my house is clean. Sometimes the clutter and stuff around me drains my energy without me even realizing it, too. It's as if I'm consciously thinking "how could I possibly go for a walk on the treadmill when I have all of these dishes to do, etc". My energy is being drained from my atmosphere, even if all I'm doing is sitting down, "relaxing". Here's some more basic math: keeping a clean house = less stress = more opportunity to make healthy choices = losing more weight. Losing weight and keeping it off doesn't just come from changing the way you eat for the better better and by exercising. Transforming all areas in your life can help you to be more successful in losing weight in the long term. Readers, what helps you lose weight beyond the standard of eating well and exercising?